Freddy Krueger. . Wallpaper and background images in the nakakasindak na pelikula club tagged: horror films nightmare on elm street freddy krueger robert englund. This nakakasindak na pelikula photo contains Fedora, nadama sumbrero, Homburg, Stetson, trilby, snap brim hat, and hat campaign. There might also be ulang, ulang, crawdad, crawdaddy, porkpie, porkpie sumbrero, Beaver, and castor. Are they saying that's from the remake? Cause it's not. yeah! I have that picture on a DVD case! Ditto, thats on my Nightmare Collection cover. I WANNA SEE THE RE-MAKE SOOOOO BAD! This pic (4 all who didn't knew) is from the FIRST Nightmare On Elm Street movie. 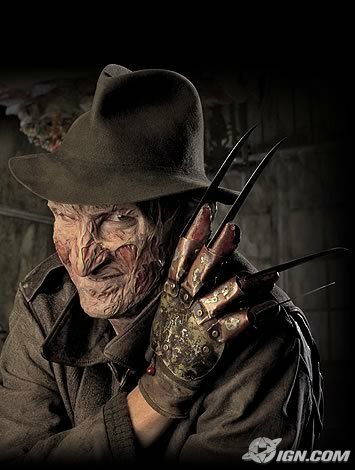 But I don't care if it's remake or not, Freddy's still SOOO COOL!!! OMG..... PISS3D THE F OFF... THE REMAKE F ING SUCKED I JUST WATCHED IT AND BECAME VERY OR SHOULD I SAY HIGHLY DISAPPOINTED IT SUCKED MY 3 YEAR OLD WAS EVEN SCARED WHO EVER REMADE THIS SHOULD FILL LIKE SH... THEY NEED TO STUDY THE ORIGINAL MOVIE TAKE NOTES I COULD DO BETTER THAN THAT. First of all, the person who made the remake also did the remake of Friday the 13th (which was really bad) and the (really good) remake of The Texas Chainsaw Massacre and it's prequel The Texas Chainsaw Massacre: The Beginning. Second of all, they did study the original ANoES, and I thought it was pretty damn good.